Web Design Chesapeake VA, Web Redesign Chesapeake | Gontarek Eye Care based in Chesapeake, VA has a custom designed Word Press website that is mobile ready. The website features rich content information, photo galleries and call to action inquiry boxes throughout. 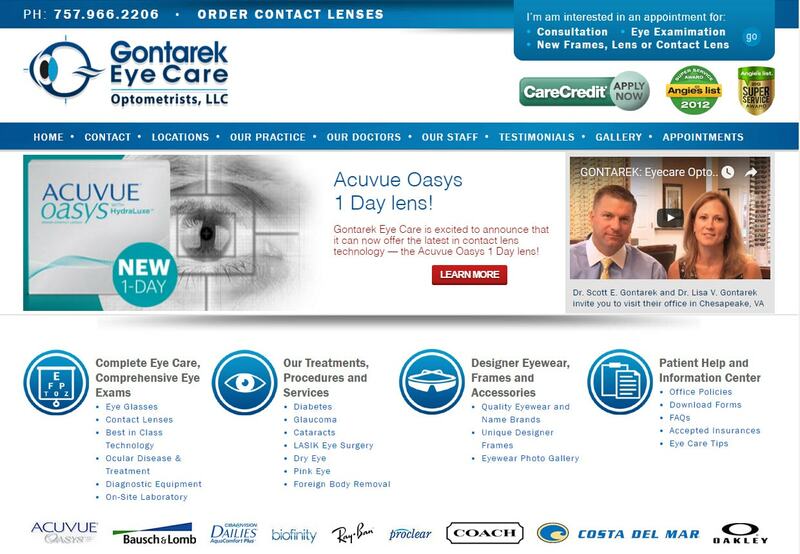 This is the 2nd website redesign for Gontarek Eyecare since becoming a VISIONEFX client many years ago. VISIONEFX provides the finest in website design for medical businesses, website design for doctor offices, and website design for healthcare providers. When searching Web Design Chesapeake VA, Web Redesign Chesapeake look no further than the web design experts at VISIONEFX. VISIONEFX, a Web design company based in Virginia Beach, VA provides services to national companies as well as small to medium businesses throughout the United States to include; custom web design, web development, E-commerce web design, Word Press web design, Joomla web development, SEO and web maintenance services. Call: (757) 619-6456 or email info@visionefx.net. Ready to get started on your new site, redesign, ecommerce or other online project! Click here. Reputation Is Everything. We make sure customer websites are running like a finely tuned machine to help them beat the competition and excel online. Take a moment and read our live Google Reviews. Visionefx, knows its important to keep your Web site, contact forms and database humming along 24/7. We support and maintains your business web site as your very own 'personal web master'. Should you try building your own website? There's lots of these systems out there; Wix, Webby, Square Space, GoDaddy site builder, Web.com and the list goes on. Take a moment a read our ecommerce 101 primer for tips on creating an ecommerce site that generates foot traffic. My current web company takes forever to do website fixes! In this current online, interactive world your business is open for inquiries 24 hours a day, 7 days a week; and your website cannot afford to be down or offline for long. What is the best software for our new website? With all the buzz words such as Joomla, Word Press, Drupal, Fusion, Cake PHP, Symphony, Dot Net Nuke, Share Point Designer & ASPX it is easy to get confused. What exactly is search engine optimization; how does it work? We started following Google back in 1998 when Google was in its’ infancy. We have learned that many things have not changed. Do you build custom database or web based applications? Visionefx President Ricardo Vidallon has been in the creative business of design advertising, branding, marketing, cable..
What roll should social networks play in my business? With so many different choices like Facebook, Twitter, Google+, Instagram, Pinterest, Flickr and many others, it is important to choose wisely. How do we prevent hacking and online website attacks? There is one undenieable truth about hacking, malware and online attacks; If you have been hit already, it’s certain that you eventually will. When should we redesign our company logo? Logos are like any other form of advertising. They have a shelf life. All major companies have changed their logo to some degree i.e., Proctor and Gamble, Westinghouse, General Motors, Ford, Coke, McDonalds and others.